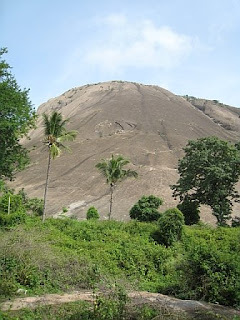 Savandurga is the largest monolith hill around Bangalore (one of the largest in the world!! 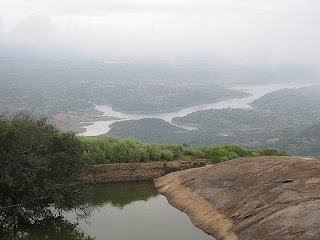 ), standing some 400mts tall, offering a fantastic view of Arkavathi river flowing into Manchinbele reservoir (more here). From Bangalore you could either take Magadi road, and turn left at the Savandurga Billboard, some 5kms before Magadi or take Mysore road to Ramanagara and turn right to get on Magadi road to the Billboard. Magadi road is getting its fresh layer of asphalt and about 80% done, the curvaceous route is a pleasurable 60km ride to Savandurga. The Mysore road is about 20kms longer, and much more of the get-away-from-the-city traffic on weekends. It was a simply irresistible combination that Madhu Avasarala (check this) stirred up - a 60km ride on a monsoon morning and a power walk up and down the monolith. I took the Magadi road and reached the base at 7, we started the climb at 7:45. The way uphill is well marked, an in some steep inclines, with foot holds. It is a good 4km climb up from behind the hill. 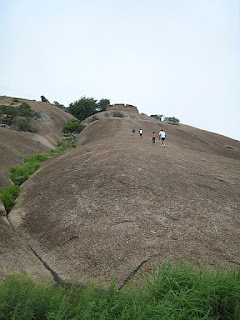 The steepest part of the climb is the first half reaching up first to some fort walls, and then to a small rain water pool. 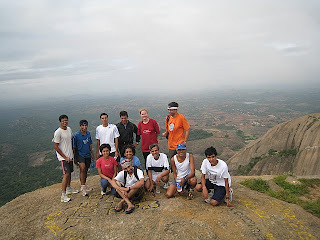 As I huffed and puffed up to this spot, I caught up with Nitin and his friend, Navendu who is a regular on this hill!! Biscuits and water went around at the top even as we took in most of the panoramic view. The second lap was the real push and I had to make an effort to be slow to save my knees on the downhill. It was such a delight to see Madhu’s son, Sanjay make it up to the peak, twice and Noel’s 7yr old daughter do her bit of rock climbing with daddy. We came down to some delicious Daliya upma, made of half wheat and lots of vegetables. I did about 5 rounds of that beating all the others, phew, exhausting, I say. Leona did great work with the camera as well. For all the fotos follow here… courtesy Leona. At Rs. 150 for fuel, Rs. 4.50 for Parle G biscuits and Rs. 2 for Bananas, it sure felt like one of those treks from my engineering days. 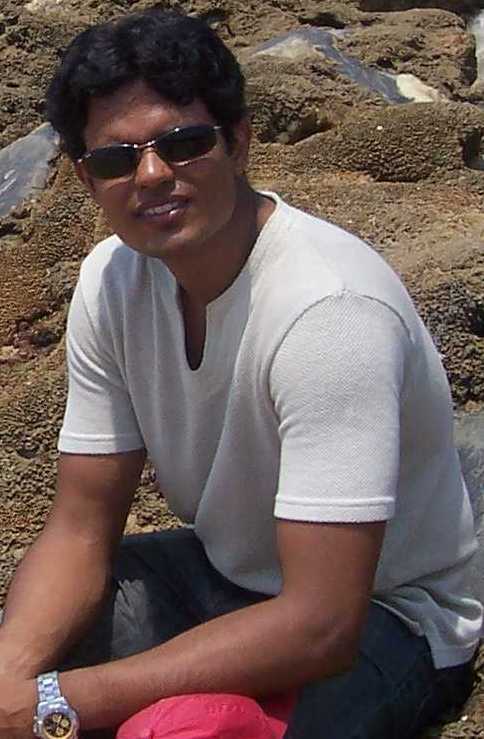 Hey manoj..why dont you write on of the KP or the sakleshpur treks you've had in college..?..i dont think we were in any of the treks together, but it sure would bring back a lot of memories..would be damn good if u cud put up some snaps as well of those days...if u decide on writing it,i would be expecting it to have a generous dose of the Manoj brand of humour!! Great idea, macha. The way I would like it is, if we make that trek together again and mix the old and the new!